In the video above I review both the Citadel RDA by Psyclone Mods and the Orion Pod System mod by Lost Vape. 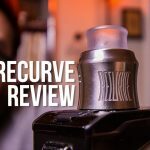 Starting with the Citadel, I reviewed it on its own, as a standalone RDA, and also against the top 2 RDA for flavor (in my opinion), the Hadaly and the Entheon, both which happen to be made by the same company. And then I spend a few more minutes talking about the Orion Pod system, which I think is the best pod device out. So in all, it was a good day for reviews. Both products exceeded my expectations by a long shot, and were very content purchases. Make sure to subscribe to DIYorDIE on YouTube for more videos like this.